The Dutch festival organization again proves its relevance in music, art & sustainability. The expansion goes on. DGTL Barcelona has just come to an end. Over 35.000 people came out to dance during the two-day festival held on Parc del Fòrum. This year it took even a bigger crowd than last year, welcoming visitors from 51 countries and seeing a big increase – up to 56% – in national visitors embracing the festival. France, The Netherlands and the UK followed closely. The festival already established itself over the past years as the highlight of Barcelona in August and surprised the crowd with good news: after expending territories to Santiago at the beginning of this year, the festival organization is launching its Madrid edition next December 5 at IFEMA, a perfect location for the latest addition to the DGTL family. “Spain was the first country outside the Netherlands that we arrived to with DGTL and we believe each new edition surpasses the previous one. We all love this place and its people, so we figured “why not take the party indoors during winter?” We are also aware that a lot of people from Madrid take the trip to enjoy the Barcelona edition and we wanted to bring the party closer to them. Logically, DGTL Madrid 2018 takes care of both wishes. And we couldn’t be happier about it!” Dave van Dalen – Marketing Director DGTL. In Barcelona, the stellar line up consisting of acclaimed headliners, local hero’s and stars in the making, took the crowd on a journey they won’t soon forget. Crowd favorite KiNK took the stage on Friday and immediately set the tone for the rest of the festival. Also Saturday saw some tremendous performances by no other than Honey Dijon, Amelie Lens, Jamie Jones and Maceo Plex, who had the honor to close the festival on one of the four stages. 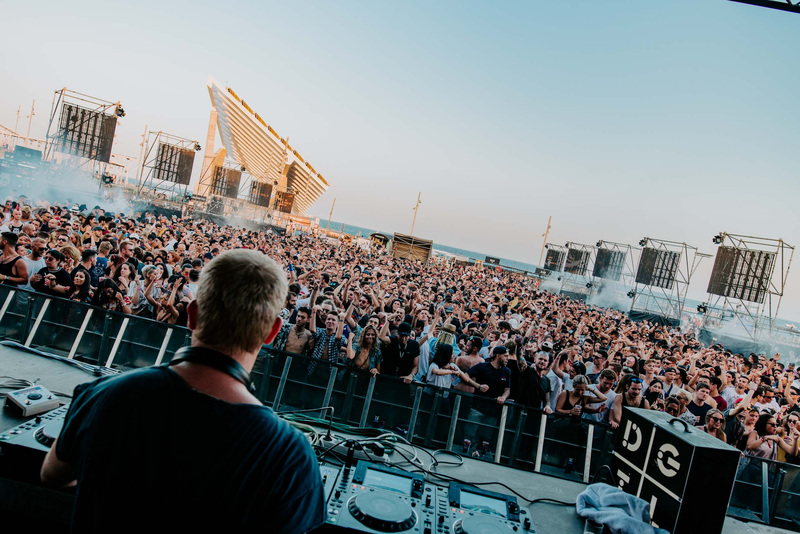 Devoted to its philosophy, DGTL has brought their take on art & sustainability to Barcelona to treat their loyal crowd on more than fine music. With implementing a circular food court also in Barcelona this year, the festival takes big strides towards their mission to becoming the first circular festival in 2020. This zero-waste objective has already led the festival to implement a meat-free catering, prohibit single-use plastic cups and to use a smart power-plan to use energy in the most efficient way possible. This year the festival took it a step further and made sure that any residual bio-organic waste, as well as biodegradable disposables of the food court would be converted into compost over the course of 6 months which will be distributed to local farmers. This results in DGTL BCN being completely food waste free this year. The European premiere of the acclaimed Cluster 2.0 and SKYLINE’s audiovisual performance were the true highlights on the art-side of the festival which was now bigger than ever before. The organization can look back at yet another successful edition. But no time to sit down and enjoy; next month DGTL will take over Tel Aviv, after which the festival moves back to its hometown where dance enthusiasts from all around the world will gather in Amsterdam for Amsterdam Dance Event during which DGTL hosts three premium events that are not to be missed. After ADE, Madrid awaits. Tickets for DGTL’s premiere in the Spanish capital will go live end of August, keep an eye on the event’s FB page for more info. See you at DGTL Barcelona 2019! Hard Yards East Coast Tour!